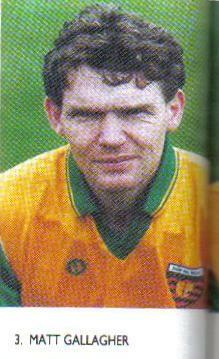 From Ballintra, Co.Donegal Matt was the full-back on Donegal's All-Ireland winning team in September 1992. He played a total of 147 times for his county. He was selected as a GAA All Star-Football in 1992. Neil Gallagher, Captain of Donegal's National Football League Winning Team 2007. Neil Gallagher showing his "war wounds" as he prepares to receive the National Football League Trophy in April 2007. From Glenswilly near Letterkenny Neil led Donegal to National Football League winning success in April 2007. He still plays centre-field for his county. David Gallagher beats his opponent to the ball. A 6’4" Meathman David has received a call-up to the Ireland squad to face Australia Down Under. A very skillful player Charlie was top scorer in Ulster on a number of occassions. He was selected as a GAA All Star-Football in 1964. He died from drowning near his home in Cootehill, Co. Cavan in July 1989. May he rest in peace. Josie Gallagher was born 1923 in Gort, County Galway. 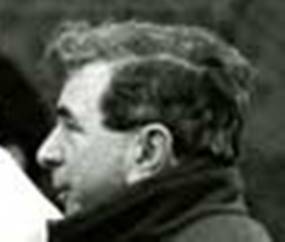 He played hurling with his local club Gort and with the Galway senior inter-county team from 1942 until 1954. Gallagher is regarded as one of the greatest players never to have won an All-Ireland medal. Offaly Hurling Selector and G.A.A Administrator Andy Gallagher. Note:We would make like to make a full list of GAA Gallaghers and we ask your help. Please forward any information you have to postmaster@gallagherclan.org . Copies of any relevant material to add to our archive would be greatly appreciated.